Recently, I was recommended to try out the imported radish from Korea by my daughter and she told me that it is sweet and crunchy when eaten raw and that after which I will not want to eat the local ones :) seriously , it is true. After having eaten it raw, I realised what I have been missing all this while . No wonder the korean loves their radish so much. Upon her recommendation, I bought one big one from the K mart which sells all korean ingredients and utensils. 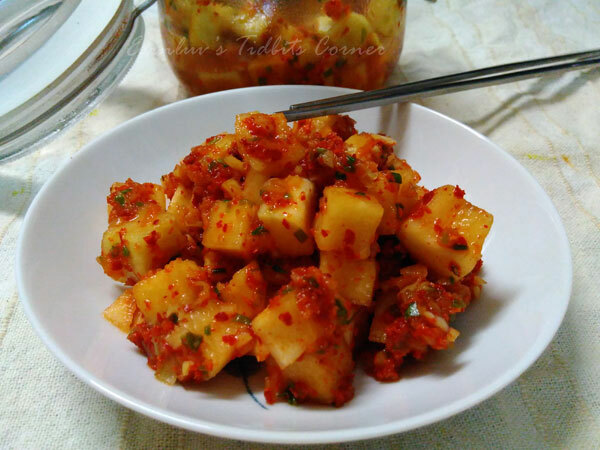 Came home, could not wait to make them into cubed radish or 깍둑설기 ( kkakdugi ) in the korean language. Making korean side dishes has become a simple task for me, for I have been making them since the day I was introduced to banchan :) Since the radish is sweet, making banchan would be ideal. Cut the radish into medium sized cubes. (It could be smaller or bigger if that’s what you prefer. Just be mindful that the radish will shrink as they go through the fermentation process.) Put the cubed radish into a large mixing bowl and add the sugar and the salt and mix them well. Leave it for 1 hour at room temperature. 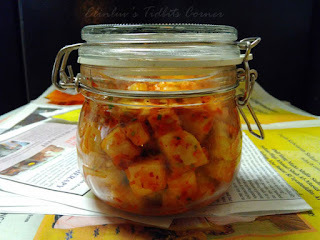 While waiting, chop the green onion into small pieces and make the Kimchi base. Blend the onion and apple with the fish sauce in a blender. (It can take a few minutes as the liquid isn’t as much as the solids.) Make the rice porridge by mixing the water and the rice flour in a bowl and heating them up for 1 min in a microwave. (It could be shorter or longer depending on the output power of your microwave). It should give you a mildly runny porridge texture. Mix all the Kimchi base ingredients (*except for 2 Tbsp of Korean chili flakes) in a medium sized bowl. After one hour, rinse the radish in cold running water a couple of times and drain any excess water for 5 mins. 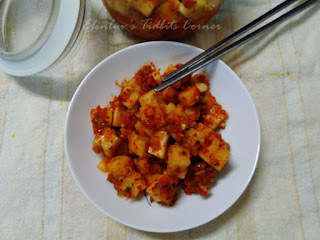 Put the radish into a clean mixing bowl and add 2 Tbsp of Korean chili flakes. Mix the chili flakes with the radish evenly. 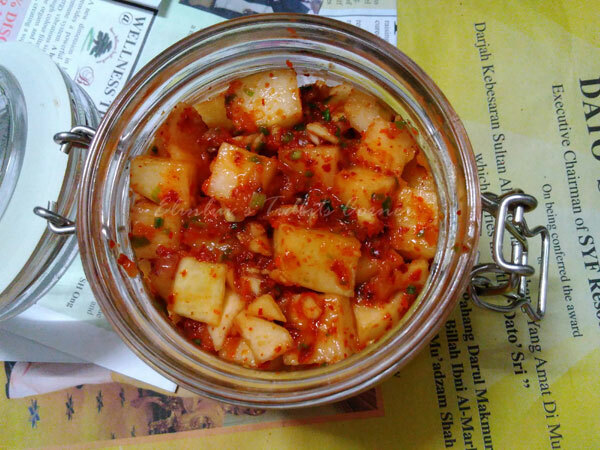 (By adding this chili flakes separately and earlier than rest of the Kimchi base, you are giving a nice vibrant colour to the radish). 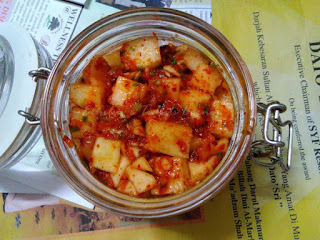 Add the chopped green onion and the Kimchi base and mix them evenly and thoroughly. Move the seasoned radish into an air tight glass container (1.5L glass jar for the above-listed quantity) and leave it at room temperature for between 6 to 24 hours depending on the temperature After that keep it in the fridge.